The Regional Museum is the main museum of the Dhamār governorate. It was built at Hirran, north of Dhamār city, in 2002. Its pre-Islamic collection comprises over hundred inscriptions of various provenance and period. The hall of pre-Islamic antiquities exhibits examples of Ancient South Arabian inscriptions carved on stone, along with artefacts such as stelae, altars, incense burners and statue bases, decorated with geometric, floral and animal designs. A number of archaic dedicatory stelae are particularly important from the historical point of view. These objects come from the neighbourhood of Dhamār and are a very archaic expression of the local inhabitants, who dedicated the inscriptions to their god ʿAthtar. 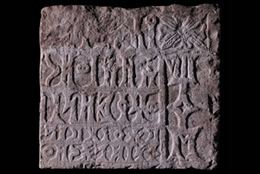 They are the most ancient epigraphic evidence from the Yemeni uplands. There are two Sabaic inscriptions written on statue bases from the city of Nashq, in the Jawf. These long, carefully engraved texts testify the devotion of the Sabaeans towards their god Almaqah. The museum has recently acquired an important collection of 24 inscribed artefacts from the region of al-Jawf that are written in Minaic and Sabaic. Most of the inscriptions are dedicated to the god Nakraḥ and probably originate from the city of Baraqish. Apart from the inscriptions written on slabs, four texts are engraved on beautifully shaped offering tables. The museum also owns a remarkable collection of bronze pendants and situlae that bear incised a dedication to Wadd. The Regional Museum of Dhamār was the first museum inventoried by the CASIS project in 2007. CASIS made a second cataloguing mission in 2009 to inventory the new objects acquired by the museum. Photos are courtesy of the Dhamār Regional Museum.